ADI is delighted to announce that the Plenary Council of Colombia’s capital city Bogota has voted overwhelmingly to ban the use of animals in circuses. 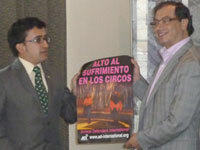 The Development Plan of the Capital of the Republic, which is a roadmap for the next four years of Mayor Gustavo Petro’s administration, prohibits all animals in circuses. The plan also includes measures for humane stray control. ADI congratulates Mayor Petro, the city councillors who made this possible, especially Councilman Roberto Saenz, and the local animal organisations and citizens who worked alongside ADI to achieve this ban. ADI is in discussion with the authorities to establish what steps will be taken if circuses ignore the ban. Bans have already been passed in Medellin and Pereira. The ban follows a vote earlier in the month in Congress to end the use of animals in circuses nationwide.